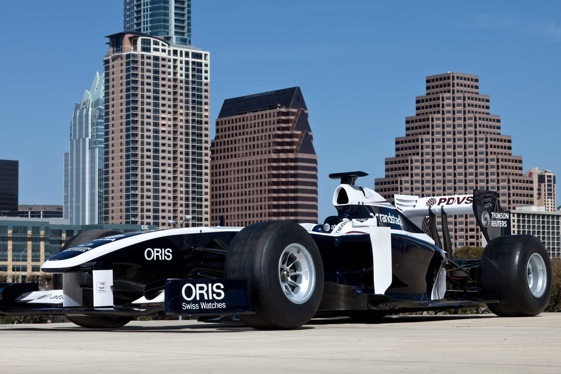 In a city named after a statesman and with a newspaper using the same generic noun, there’s not much statesmanship going on in Austin when it comes to the future of the Formula One race scheduled for June of 2012. Watching the sausage being made while democracy collides with F1’s current era of wooing governments as a way to raise revenue, I remain reasonably optimistic about a race next year at the Circuit of the Americas. There is the usual mainstream cultural bias against motor racing at work in Austin, a town well known for Those Who Would Take Exception to begin with. The local populace often alternates between outrageous liberal activism, classical laissez-faire liberalism and old-fashioned conservatism of the “not in my backyard” stripe. But I suspect when all is palavered and done, and following a fair fight full of good ol’ American mud-slinging via the newspaper comments, among other locations, the city council will endorse the plan to invest $25 million annually of state money in the F1 race for the next 10 years. I could be wrong. And, on the subject of F1 I have been wrong. About the last thing I got really correct was predicting a crowd of more than 200,000 at Indy for the first F1 event at the hallowed Brickyard way back when. Please, let’s not talk about US F1. final acid test, given that a capable promoter, Tavo Hellmund, plus well-financed and capable partners like Red McCombs and Bobby Epstein, are fighting hard to bring the circus to town. If these gentlemen, along with the support of Austin’s mayor and the state’s comptroller, who is offering the $25 million per year, can’t make it happen, then, well… it doesn’t look good. My perspective is from the neighborhood in Atlanta now known as the West Side. As the owner of three properties in this in-town area where I live, I’ve got some skin in this game. At present, you can’t find anybody in the city of Atlanta who doesn’t acknowledge the West Side is a happening place, a booming, charming cultural mecca of mixed use and mixed incomes with a multi-racial, multi-ethnic populace and a very positive future. None of this would have happened without the 1996 Centennial Olympic Games, many of which took place adjacent to the old run-down neighborhood west of downtown that didn’t even have a name. The presence of the Games at Georgia Tech, the World Congress Center and the Georgia Dome brought focus and attention to the in-town possibilities. Afterward, the push brought on by the Games opened up new possibilities in what became known as the West Side. Suddenly, it was adjacent to new highly developed areas like the Centennial Olympic Park, the new Georgia Acquarium, etc. They may not have been sufficient, but the Games were necessary for the revival of this 25 square mile area – a gigantic patch in terms of the over-all size of the city. On a broader, less self-interested scale, Atlanta finally lived up to its handle of an international city and it continues to reap the benefits from infrastructure established for the games, including Turner Field, home of the Braves. In Travis County, adjacent to the city of Austin and its international airport, the Circuit of the Americas is dedicated to transforming what was mostly scrubby brushland, truck depots and dumps of various kinds. But when you start talking millions and foreigners like F1’s impressario Bernie Ecclestone being on the receiving end, folks quickly lose sight of a blight than can be transformed, construction jobs and a potential high-tech future. Money worries recently postponed the vote of the Austin City Council needed to OK the contract between the city and the promoters. 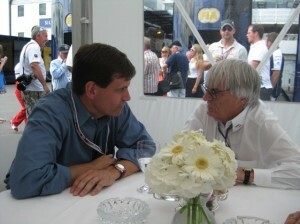 That contract is necessary to get the $25 million from the state – which will end up in Ecclestone’s hands. One can only hope sanity prevails and the folks on the council will recognize along with other city leaders that Austin will move up several notches on the world recognition scale as a result of F1 coming to town. The University of Texas alone will reap tremendous recognition for its research facilities, including those dedicated to renewable sources of energy. As for that mesquite-covered portion of the Travis County where the Circuit of the Americas is now being built, it stands to gain a new lease on life – at the risk and expense of the track promoters. I do take exception – along with many expert economists and everyday American residents – to the wildly optimistic models about how a $25 million annual investment will produce a concomitant amount of tax benefits. But it’s the same baloney they’ve been selling for almost a decade to support the Super Bowl in Dallas, the Final Four and other sporting events in the state of Texas. What’s different? This is motor racing. As such, it brings far more potential investment due to spinoffs than any stick-and-ball sport. And it’s F1, which can bring the world to the doorstep of Austin annually. At a price and hassle far below the cost of the Olympic Games. As a former resident of Austin, I believe the city and its leaders will step up to the challenge of negotiating who pays for what under the contract to host F1, which has become the focus of the bickering and political bluster. This is the way it should work in a democracy, because those bills for firemen, policemen and traffic coordinators needed to make the race happen add up quickly. Also, who will pay for the necessary widening of roads near the Circuit of Americas? That’s an issue that should be decided in a public forum. Ultimately, it’s a matter of whether Austin wants to remain a semi-sleepy medium size city, a cultural by-way that hosts the horse-trading down by the river at the state capitol, music on Sixth St. and a music festival or two, plus the Longhorn football games. Or, if the city wants to step up to a future with F1 that will more than repay the state’s investment while taking Austin and Travis County toward something that latter-day versions of Waylon and Willy would have to come up with some new lyrics for. I dearly hope that the City Council realizes the positive impact that the F1 project has brought to Austin currently and will continue to do so in the future. The project has already created over 1000 construction jobs, numerous relationships with area universities and will generate a lot of money for the Central Texas economy. Everyone please doesn’t confuse Major Event Trust Fund (METF) money with Texas education money. I keep hearing that we should “spend that money on our teachers and education instead of F1.” However, there are rules about using designated funds in a state or federal budget. The $25 million from the (METF) cannot be spent on other uses any more than federal foreign aid to Afghanistan can be magically re-directed for a specific project in Texas within a certain fiscal year. I wish certain Austinites would explore these financial details before they rant about the burden of F1 to Austin. You’re right and sorry to troll. The problem is that our governor and legislators decided that cutting education funding was okey dokey but METF money had to be preserved at all costs. They had the authority to transfer that money for better purposes but chose not to. That’s immoral and Austin’s city council transfering it to people who don’t need it is also immoral. If the $250 million was spent on infrastructure it would have created just as many jobs and would benefit all of us. Better highways make for better transit and commerce. Additional reservoirs on the Colorado would lessen the effects of drought. Instead it’s going to a billionaire for a race track. If the guy wants to operate a profitable racing enterprise, that’s his business, and I’d wish him the best of luck since a profitable business does create jobs and benefits for many. But this is a taxpayer subsidy that goes on top of his profit. It’s just wrong. You need to understand F1 before you comment about it. You sound like a fool if you don’t! When did the author live in Austin? No one who’s been to the city this century would describe it as a “semi-sleepy medium size city, a cultural by-way…” yada yada yada. Are you trying to say this city could be as cool as Atlanta? Wow, sign me up. F1 is an awkward fit for Austin and everyone knows it. If they want to give it a shot, fine, but why should the people of Texas pay a billionaire $25 million a year for his trouble? That money could pay 500 teachers for a decade, but instead they’re being laid-off in droves while this jerk gets his palm greased. These kinds of projects almost always deliver less than they promise, so if the council decides not to endorse a project that expands the city laterally instead of vertically and further congests our highways and nightlife, more power to them. This isn’t about hippies or culture clash. This is about a rich guy leaning on the council to add HUNDREDS OF MILLIONS OF DOLLARS to his already overflowing bank account. That’s all it’s about. Well, that and Rick Perry’s bid for the presidency. Doesn’t hurt to have another billionaire owing you a favor or two. We need to put POLITICS aside & think of the absence of jobs that people have now & the many opportunities they can have tomorrow with what this is bringing to Central Texas. Reading some of the articles & the pushback opposing this makes me realize that one cannot see the forest for the trees. Here is the perfect chance for a unemployed person who has had their job cut due to the economy to be able to see the light at the end of the tunnel with a job opportunity on the horizon. I think of the NUMEROUS restaurant owners who right now are anticipating hiring additional staff during high season for the races, the limousine services who can consider buying more cars & hiring more drivers, the retail stores that will be able to benefit from the tourist who will be enjoying shopping while they are visiting and the Marriot Marquis Hotel that will be building a 1003 room hotel on Congress Avenue & how many people that will employ. I think of all the hotels that will be able to reap the rewards of having booked rooms & all the amenities that go with the lifestyle that these people who attend these races enjoy. My question to the opposition is “Ask yourself when was the last time you heard from someone that they recently became unemployed?” Right now we should be saying two words – THANK YOU for considering the Central Texas area & what business & job growth we will derive from their decision to honor us & to locate the first & only Formula 1 race track here in the United States. Yes, THANK YOU for taking $25 million of our tax dollars every year. Thank you for taking every year a fee worth more than all the money I’ll make over a lifetime of hard work and dedication. This mentality is the reason the wealthiest 1% own 40% of the wealth in this country. It’s not b/c they’re smarter or work harder, and it’s not b/c the market can’t work. It’s b/c they’ve convinced millions of Americans that they should be grateful for the opportunity to give them money for nothing. This is every stadium ever paid for by city residents who can’t afford a ticket to the game. This is every bailout to a bank or lender who still expects you to pay 17% interest on your credit card every month. Let us thank them for the trickle of our own money that we get back in return. The reason we don’t have jobs is not b/c the super rich don’t have enough money to invest. It’s b/c we don’t have enough money to spend. If we keep giving it away the situation is never going to change. I have yet to hear even one rational argument against supporting the track. Come on folks, be sensible. John Bircher on meth…vs. the pinko commie bedwetting water pipe crowd……SHOWDOWN THROWDOWN in AUSTIN….!!! BETHERE !!! It seems to be an odd combo…TEXAS and F 1 hooey hooey following…. until you think of Shelby FORDS and CHEVY Chapperales…..then it kinda makes since….. I hope they do it…..I also hope we can have someone make it more USA….like in the past. Maybe cram an updated FORD COSWORTH into something that will handle ….maybe even a talented AMERICAN with a name I can pronounce to drive it. sing it Paul S. & Art G. …. I’m embarrassed to call myself an austinite. For a city purportedly progressive, our council’s heads are placed firmly in the posterior. I have lived in Austin all my life I am 47. This is the typical Austin hippie, keep Austin Weird, NIMBY, keep it green, if we don’t improve it they won’t come mentality that has plagued this city forever. Most of the people against it live in downtown or on the west side. I have bring up the subject to as many people as I can, not just friends but strangers that I run into at work. NOT ONE SINGLE PERSON was against F-1 coming to Austin. It often seems that here the minority crowd rules the day, if they would let the smoke from their doobie clear the air they might see that a side of town that has been shunned since the beginning of Austin might really get an economic boom it has long deserved.